Objective: To investigate the correlation between the costimulatory molecules (CD28, CTLA-4, CD80 and CD86) and the development, progression of gastric cancer. Methods: Samples of gastric cancer tissues and tumor-adjacent normal tissues were collected from 48 gastric cancer patients who were admitted to this hospital between January 2016 and February 2017. Protein expressions of CD28, CTLA-4, CD80 and CD86 were detected in the gastric cancer tissues and tumor-adjacent tissues via Western blotting assay, while the protein levels and positive expressions of CD28, CTLA-4, CD80, CD86 and vascular endothelial growth factor-A (VEGF-A) were measured through immunohistochemistry assay, and we investigated the correlations of CD28, CTLA-4, CD80 and CD86 expressions with the expression of VEGF-A in gastric cancer tissues. Results: Analysis of the Western blotting assay revealed that protein expressions of CD28, CTLA-4, CD80 and CD86 in the gastric cancer tissues were significantly higher than those in the corresponding tumor-adjacent normal tissues (p<0.05). In the gastric cancer tissues of patients, the positive rates of protein expressions of CD28, CTLA-4, CD80, CD86 and VEGF-A were significantly elevated in comparison with the corresponding tumor-adjacent normal tissues (p<0.05). Through Pearson correlation analysis, protein expressions of CD28, CTLA-4, CD80 and CD86 in gastric cancer tissues of patients were positively correlated with the expression of VEGF-A (r=0.695, 0.682, 0.637, 0.614; p<0.05). Conclusion: Costimulatory molecules, including CD28, CTLA-4, CD80 and CD86, are highly expressed in gastric cancer, which correlates with the expression of VEGF-A in gastric cancer tissues. Costimulatory molecules may facilitate induce the angiogenesis of tumor through promoting the expression of VEGF-A, thereby accelerating the development and progression of gastric cancer. Thus, expression levels of CD28, CTLA-4, CD80, CD86 and VEGF-A may serve as the reference indicators for evaluation of the biological behaviors in gastric cancer. Gastric cancer is one of common malignant tumors in China, and, in recent years, its incidence rate keeps increasing. Gastric cancer is developed by many factors, but its specific pathogenesis remains unknown yet . The efficacy on gastric cancer depends on the pathological type of gastric cancer, clinical staging and metastasis, and lack of significant clinical symptoms contribute to the hidden onset of gastric cancer in an early stage. Most of the patients have been diagnosed as progressive gastric cancer, and local infiltration and distant metastasis of progressive gastric cancer are factors contributing to the death of patients [2,3]. Continuous improvement in surgical treatment have been made in recent years, plus the great advance in neo-adjuvant chemotherapy and radiotherapy, but the prognosis remains poor for those in an advanced stage. At the time of diagnosis, local metastasis has been confirmed in many patients with a 5-year survival rate of 20% to 25% . Carcinogenesis of gastric cancer is a complex and multi-step process involving many factors, including the deactivation of tumor suppressor and activation of oncogene . Immune escape is critical to the development and progression of tumor, and the apoptosis and nonresponsiveness induced by tumor antigen specific T cells are the major mechanisms of immune escape of tumor cells, in which co-stimulatory molecules and the corresponding regulation system are involved. During the immune response, activation of antigen-specific T cells requires the mediation of two signals, in which the second signal is the co-stimulating signal, mainly mediated by molecules in B7 family and CD28. Lack of co-stimulating signals results in the dysfunction of T cells . Incorporation of B7 gene may enhance the immunogenicity of tumor cells, therefore effectively activating the anti-tumor effect of T cells . According to a relevant study , attenuated expression of insufficiency of expression of B7 gene may cause the immune escape of tumor cells. Currently, there remain few studies reporting the expressions and clinical significance of expressions of costimulatory molecules, including CD28 and CTLA-4, as well as their ligands, CD80 and CD86. Thus, the aim of this study was to investigate the expressions of CD28, CTLA-4 and their ligands, CD80 and CD86 in gastric cancer tissues, thus exploring the correlation between the expressions of these costimulatory molecules and development and progression of gastric cancer, so as to provide new ideas for pathogenesis of gastric cancer. With 48 gastric cancer patients who were admitted to this hospital for treatment between January 2016 and February 2017 as subjects in this study, all patients underwent surgical resection, and the gastric cancer tissues and the normal tissues adjacent to the lesion were adopted for pathological studies. Inclusion criteria: a) patients who were pathologically diagnosed as gastric cancer; b) patients who had not received any radiotherapy or chemotherapy before surgery; c) patients with perfect data. Exclusion criteria: a) patients complicated with other tumors; b) patients complicated with diseases in heart, brain and some other major organs; c) patients with incomplete data. Among 48 patients, there were 25 males and 23 females aged between 37 and 72 years old with an average age of (58.4 ± 1.7) years old. Major reagent: (1) Rabbit anti-human CD28, CTLA-4, CD80 and CD86 polyclonal antibodies were purchased from Accela ChemBio (Shanghai) Co., Ltd.; (2) rabbit anti-human VEGF-A polyclonal antibody was purchased from Shanghai Changjin Biotech Co., Ltd.; (3) DAB color developer and immunohistochemistry detection kit for SP were purchased from BOSTER (Wuhan) Biological Technology Co., Ltd.; (4) RIPA lysis was purchased from Beijing Bioteke Co., Ltd. Detection methods: (1) Western blotting assay for protein levels of CD28, CTLA-4, CD80 and CD86: After the samples were sufficiently ground, RIPA lysis was added, where samples were ground again; samples were then centrifuged, and the supernatant was collected to prepare the standard curves for detecting the protein levels of CD28, CTLA-4, CD80 and CD86 in sample tissues; after electrophoresis, samples that were separated were transferred on the polyvinylidene fluoride (PVDF) membrane; at 4°C, samples were incubated with primary and secondary antibodies followed by color development and fixation. (2) Immunohistochemical SP method for measurement of positive protein expressions of CD28, CTLA-4, CD80 and CD86: Samples tissues were embedded by paraffin and sliced into sections for experiments in strict accordance with the instructions of corresponding kits. (3) Immunohistochemical SP method was applied to detect the positive expression of VEGF-A in gastric cancer tissues in strict accordance with the instructions of corresponding kits. Evaluation of the positive protein expressions of CD28, CTLA-4, CD80, CD86 and VEGF-A was carried out by semi-quantitative method in combination with Berry classification : Stained cytoplasm indicated positive protein expressions of CD28, CTLA-4, CD80, CD86 and VEGF-A, and results were scored in accordance with the positive rate and color intensity, and the expression level was determined through the color intensity, in which 0 point was for color intensity that was the same to that of the control, 1 point for faint yellow, 2 points for pale brown and 3 points for dark brown. As for the portion of positive cells in observed cells, 1 point was for portion of positive cells not higher than 10%, 2 points for portion between 11% and 50%, 3 points for portion between 51% and 75%, and 4 points for portion higher than 75%. Production of these two scores between 0 and 3 points was recorded as (-), between 4 and 5 as (+), between 6 and 7 as (+ +) and higher than 8 points as (+++). Production not higher than 3 points was deemed as negative, or positive. SPSS 21.0 software was applied for data analysis. Chi-square test was performed for comparison of the positive rate between groups, and t test for comparison of measurement data between groups. Correlation was identified via Pearson correlation analysis. p<0.05 suggested that the difference had statistical significance. Western blotting assay showed that protein expressions of CD28, CTLA-4, CD80 and CD86 in gastric cancer tissues of patients were significantly higher than those in the normal tissues adjacent to the tumors with β-actin as internal reference (p<0.05; Figure 1). 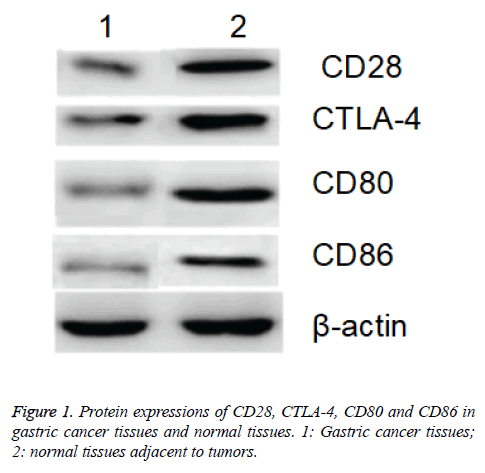 Figure 1: Protein expressions of CD28, CTLA-4, CD80 and CD86 in gastric cancer tissues and normal tissues. 1: Gastric cancer tissues; 2: normal tissues adjacent to tumors. Protein expressions of CD28, CTLA-4, CD80, CD86 and VEGF-A were exhibited as brown granules in cytoplasm (Figures 2-6). In gastric cancer tissues, positive protein expression rates of CD28, CTLA-4, CD80, CD86 and VEGFA were significantly higher than those in the normal tissues adjacent to tumors (p<0.05; Table 1). Table 1: Expressions of CD28, CTLA-4, CD80, CD86 and VEGF-A in tissue samples. Figure 2: Protein expression of CD28 in gastric cancer tissues (SP × 200). (A): Positive protein expression of CD28; (B): Negative protein expression of CD28. Figure 3: Protein expression of CTLA-4 in gastric cancer tissues (SP × 200). (A): Positive protein expression of CTLA-4; (B): Negative protein expression of CTLA-4. Figure 4: Protein expression of CD80 in gastric cancer tissues (SP × 200). (A): Positive protein expression of CD80; (B): Negative protein expression of CD80. Figure 5: Protein expression of CD86 in gastric cancer tissues (SP × 200). (A): Positive protein expression of CD86; (B): Negative protein expression of CD86. Figure 6: Protein expression of VEGF-A in gastric cancer tissues (SP × 200). (A): Positive protein expression of VEGF-A; (B): Negative protein expression of VEGF-A. Through Pearson correlation analysis, we found that in gastric cancer tissues, protein expressions of CD27, CTLA-4, CD80 and CD86 were positively correlated with the expression of VEGF-A (r=0.695, 0.682, 0.637, 0.614; p<0.05). According to the statistics, gastric cancer, as a kind of common malignant tumors, has taken the first place in all malignancy of digestive tract in China, and the infiltration and metastasis are major factors affecting the prognosis. With unclear pathogenesis and pathogen, gastric cancer is believed to be correlated with the genetic factors, chronic infection, disorders in autoimmune system and endocrine dysfunction. Immunological regulation and disorder in immune functions are critical to the development of gastric cancer. Activation of T cells requires the stimulation from 2 extracellular signals, in which the first signal, also known as the identification signal, is antigen-specific, mainly originated from the specific combination of T cell receptor and MHC-antigen peptide complex, which is necessary to the activation of T cells, but can hardly give rise to the proliferation of T cells or secretion of cytokines. As for the second signal for T cell activation, it is the costimulatory signal mediated by the membrane protein of T cell and its ligand, and this signal is critical to the complete activation of T cell after identification of antigen [10,11]. In presence of the first and second signals, T cells can be activated for clone and proliferation, thereby generating the immune effects; in presence of only the first signal, it results in the non-response state of T cells, or immune tolerance, or even apoptosis; however, the excessively robust second signal usually leads to the excessive activation of T cells, thus giving rise to the autoimmune diseases. Among the costimulatory molecules, CD28, CTLA-4 (also known as CD152), CD80 and CD86 are the most important molecules spread on surface of T cell. Combination of CD28 and CD80 can facilitate the proliferation of Th1 cells; while the combination of CD28 and CD86 can promote the proliferation of Th2 cells. CD28 and CTLA-4, despite of the similar structures, are a pair of costimulatory molecules with positive and negative regulation functions, respectively [12,13], while the former can provide the signal necessary for activation of T cells through binding with the ligand, and the latter produces an inhibitory effect through providing feedback immune regulation signals. Currently, it has been reported in some studies [14,15] that the expressions of CD28, CTLA-4, CD80 and CD86 in peripheral blood are detected through flow cytometer. In this study, the protein expressions of CD28, CTLA-4, CD80 and CD86 were detected via immunohistochemistry assay and Western blotting assay, and the results of Western blotting assay showed that protein expressions of CD28, CTLA-4, CD80 and CD86 in the gastric cancer tissues were significantly higher than those in the tumor-adjacent normal tissues (p<0.05). Also, the results of immunohistochemistry assay also revealed that the positive expression rates of CD28, CTLA-4, CD80 and CD86 in gastric cancer tissues were significantly higher than those in the tumor-adjacent normal tissues (p<0.05). Thus, results suggested that protein expressions of CD28, CTLA-4, CD80 and CD86 are correlated with the development and progression of gastric cancer. VEGF-A is a major factor in family of VEGF family, and is characterized by regulating the angiogenesis. Through the level of VEGF-A, quantity and degree of newly generated vessels can be evaluated through various perspectives . Immunohistochemistry assay of VEGF-A showed that the positive expression rate of VEGF in the gastric cancer tissues was significantly higher than that in the normal tissues adjacent to the tumors (p<0.05), suggesting that the excessive expression of VEGF-A is related with the development and progression of gastric cancer. Further analysis showed that there were significant correlations between the expressions of CD28, CTLA-4, CD80 and CD86 and that of VEGF-A, and those correlations were positive, suggesting that CD28, CTLA-4, CD80 and CD86 may regulate the expression of VEGF-A, in which CD28, CTLA-4, CD80 and CD86 may facilitate angiogenesis in gastric cancer tissues through activating and upregulating the expression of VEGF-A. In conclusion, costimulatory molecules, including CD28, CTLA-4, CD80 and CD86, are highly expressed in gastric cancer, which correlates with the expression of VEGF-A in gastric cancer tissues. Costimulatory molecules may facilitate induce the angiogenesis of tumor through promoting the expression of VEGF-A, thereby accelerating the development and progression of gastric cancer. Thus, expression levels of CD28, CTLA-4, CD80, CD86 and VEGF-A may serve as the reference indicators for evaluation of the biological behaviors in gastric cancer. Ohba R, Iijima K. Pathogenesis and risk factors for gastric cancer after Helicobacter pylori eradication. World J Gastrointestinal Oncol 2016; 8: 663-672. Fu YF, Gui R, Liu J. HER-2-induced PI3K signaling pathway was involved in the pathogenesis of gastric cancer. Cancer Gene Ther 2015; 22: 145-153. Qiu H, Zhang L, Ren C. Targeting CDH17 suppresses tumor progression in gastric cancer by downregulating Wnt/β-catenin signaling. Plos One 2013; 8: e56959. Aljubran AH, Griffin A, Pintilie M. Osteosarcoma in adolescents and adults: survival analysis with and without lung metastases. Annals Oncol 2009; 20: 1136-1141. Chen JS, Wu BB, Bao HL. Relationship between CIP2A expression, and prognosis and MDR-related proteins in patients with advanced gastric cancer. Int J Clin Exp Pathol 2015; 8: 15007-15012. Pan HW, Li SC, Tsai KW. MicroRNA dysregulation in gastric cancer. Curr Pharmaceut Design 2013; 19: 1273-1284. Morioka J, Kajiwara K, Yoshikawa K. Adenovirus-mediated gene transfer of B7.1 induces immunological anti-tumor effects in a murine brain tumor. J Neuro-Oncol 2002; 60: 13-23. Roth TJ, Sheinin Y, Lohse CM. B7-H3 ligand expression by prostate cancer: a novel marker of prognosis and potential target for therapy. Cancer Res 2007; 67: 7893-7900. Numata M, Oshima T, Yoshihara K. Relationship between RegIV gene expression to outcomes in colorectal cancer. J Surg Oncol 2011; 104: 205-209. Diehn M, Alizadeh AA, Rando OJ. Genomic expression programs and the integration of the CD28 costimulatory signal in T cell activation. Proceed Nat Acad Sci U. S. A. 2002; 99: 11796-11801. Leónponte M, Ahern GP, O'Connell PJ. Serotonin provides an accessory signal to enhance T-cell activation by signaling through the 5-HT7 receptor. Blood 2007; 109: 3139-3146. Wong CK, Lit LC, Tam LS. Aberrant production of soluble costimulatory molecules CTLA-4, CD28, CD80 and CD86 in patients with systemic lupus erythematosus. Rheumatology 2005; 44: 989-994. Wang CJ, Heuts F, Ovcinnikovs V. CTLA-4 controls follicular helper T-cell differentiation by regulating the strength of CD28 engagement. Proceed Nat Acad Sci U. S. A. 2015; 112: 524-529. Bijl M, Horst G, Limburg PC. Expression of costimulatory molecules on peripheral blood lymphocytes of patients with systemic lupus erythematosus. Annals Rheumatic Dis 2001; 60: 523-526. Ip WK, Wong CK, Leung TF. Plasma concentrations of soluble CTLA-4, CD28, CD80 and CD86 costimulatory molecules reflect disease severity of acute asthma in children. Pediatric Pulmonol 2006; 41: 674-682. Hirokawa T, Karshafian R, Pavlin CJ. Insonation of the eye in the presence of microbubbles: preliminary study of the duration and degree of vascular bioeffects-work in progress. J Ultrasound Med 2007; 26: 731-738.